Whether it’s a fleet of five or five thousand, transportation companies can’t afford to lose touch with their assets or the valuable cargo they are transporting. To operate efficiently, businesses need timely, reliable information about their fleet — where it is, if and when it needs service, whether it has been tampered with, lost or stolen, how it can be better utilized and if the quality of its cargo is intact. ORBCOMM’s end-to-end solutions combine global network services with industry-leading hardware and robust web analytics and reporting applications to enable the transportation industry to stay connected to their assets anywhere in the world. ORBCOMM has recently taken its transportation solutions one step further with the launch of ORBCOMMmobile, a robust mobile application for both iOS and Android devices that facilitates ubiquitous, easy access to ORBCOMM solutions and technology. The transportation service featured in ORBCOMMmobile supports ORBCOMM’s ReeferTrak® cold chain monitoring solution, enabling customers to monitor and control refrigerated assets in real-time from their mobile devices. ORBCOMMmobile for ReeferTrak significantly improves fleet management and efficient route planning by enabling customers to view the location of their assets and run pre-defined reports. Customers can also access detailed status and maintenance reports to monitor an asset’s temperature and maintain regulatory compliance, for maximum visibility where and when they need it. 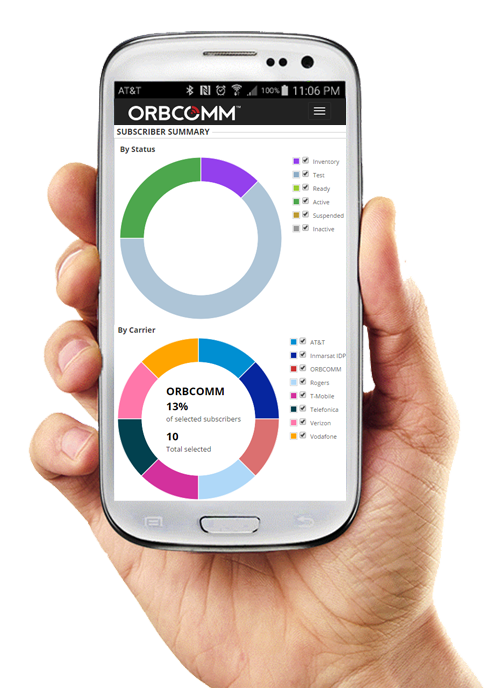 The ORBCOMMconnect service, also available in ORBCOMMmobile, enables subscriber management on the go. This convenient, easy-to-use mobile app allows ORBCOMM’s customers to quickly monitor status, activate, suspend or deactivate a subscriber, change a price plan and access a snapshot view of device activity from their mobile devices. Now it’s easier than ever before to do business with ORBCOMM outside of the traditional office environment and stay connected to transportation assets anytime and anywhere. For more information about ORBCOMMmobile, visit us at CTIA Super Mobility 2015 at booth 4843, or email us at sales@orbcomm.com. 1 Pings/Trackbacks for "Connected Transportation Solutions: Introducing ORBCOMMmobile"